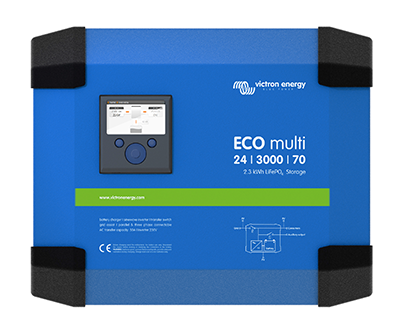 Inverter chargers are a combination of an inverter, battery charger and transfer switch all built into a single compact enclosure. When AC power is available, the inverter charger charges any connected batteries. At the same time it allows any surplus AC power to pass through and power any downstream AC loads, which could be anything from a television set to a microwave oven. When AC power is disconnected, the unit inverts DC battery power into AC electricity and continues to supply electricity to the downstream AC loads. The exceptionally fast transfer from AC to DC supply happens automatically by means of the built in transfer switch. Inverter chargers have many applications and can often be found in marine, industrial, renewable, UPS and telecom backup systems. Choose from a range of voltages, power and battery charging amps to suit your application.